At 2 a.m. on Sunday 27 October, the clocks will go back by one hour to signal the start of British Winter Time. This year, Suffolk Fire and Rescue Service (SFRS) is encouraging residents to ‘Tick, Tock, Test’ – a memorable phrase which provides a catchy reminder to prompt everyone into action when changing timepieces throughout the home. A working smoke alarm can buy the valuable time people need to get out, stay out and call 999. Figures show that people are more than four times as likely to die in a fire if they don’t have a working alarm. 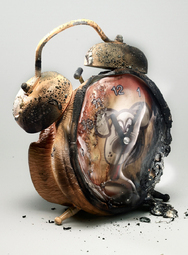 Councillor Colin Spence, Suffolk County Council’s cabinet member for public protection said; “Tick, Tock, Test is straight talking, easy to remember and intrinsically links clock change weekend to testing your smoke alarm. “A working smoke alarm is a proven life-saver and is absolutely essential in keeping you and your family safe. Worryingly, only half of all householders who own a smoke alarm say that they test it on a regular basis. “Don’t take the chance on your family’s life. When you change your clock this weekend, please take a few seconds to test your smoke alarm.